There has to be fried chicken. Seriously, if there is no fried chicken, people might just opt out of the potluck entirely. Greg must bring his famous Asian chicken salad. I’m not sure if it’s a blessing or a curse that the office staff will not accept any other dish from him, but at least he doesn’t have to wonder what he’s bringing to the potluck. The vegetarians in the office get stuck with the sad, bagged salad and limp veggies from the veggie tray picked up in a rush that morning on the way to the office. Really, folks, nobody likes those veggie trays. Don’t buy ’em! So, for the last day of Vegetarian Awareness Month, I swore to become more aware of the vegetarians and vegans in the office and made something special for them. 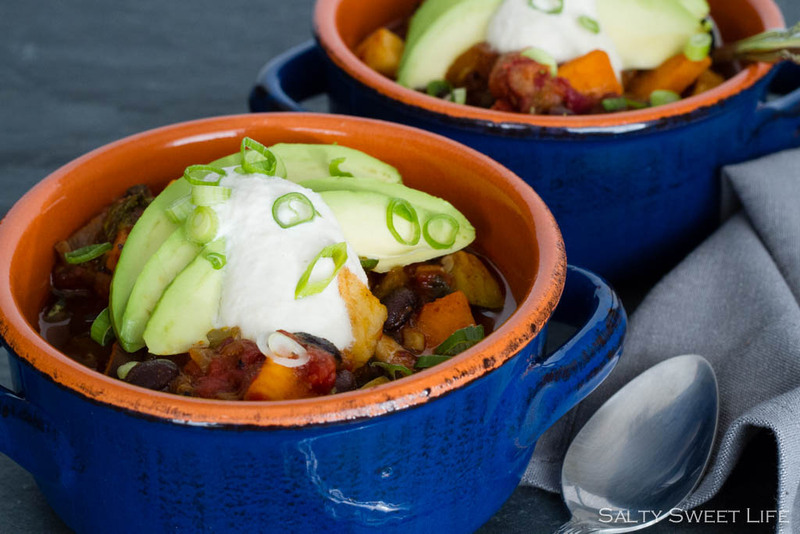 Chef Chad Sarno’s Smoky Veggie Chili perfectly fit the bill and to my surprise, it was a big hit with the omnivores as well! 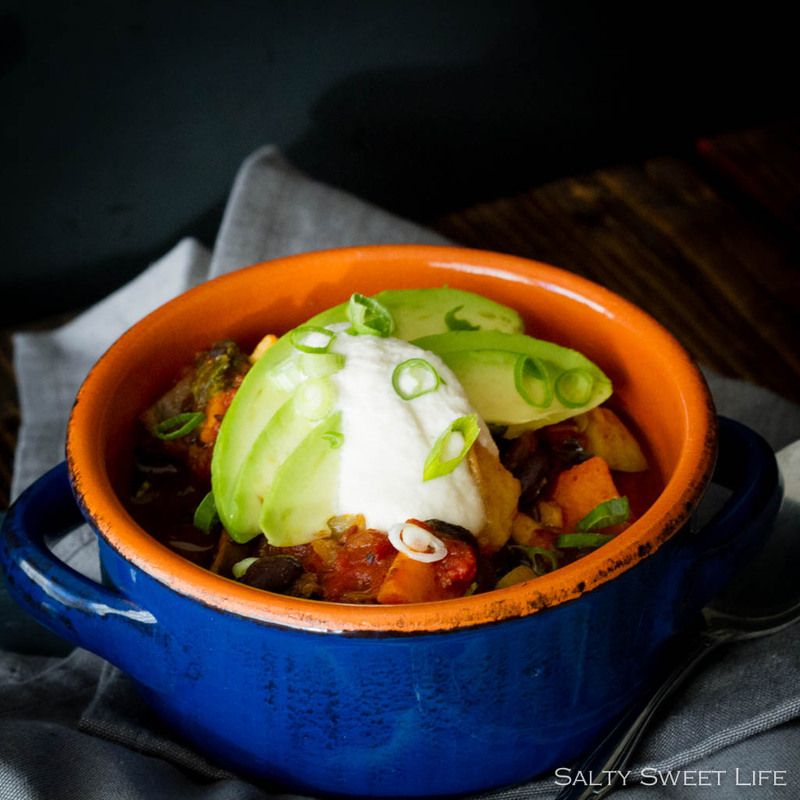 This chili has a perfect amount of heat and is so full of vegetables that the meat isn’t missed at all! Chopping lots of vegetables always takes a bit of time, but once the initial preparation is out of the way, the chili comes together very quickly. I was lucky enough to have some hatch chiles in the freezer that I added to the recipe, but of course that is completely optional. 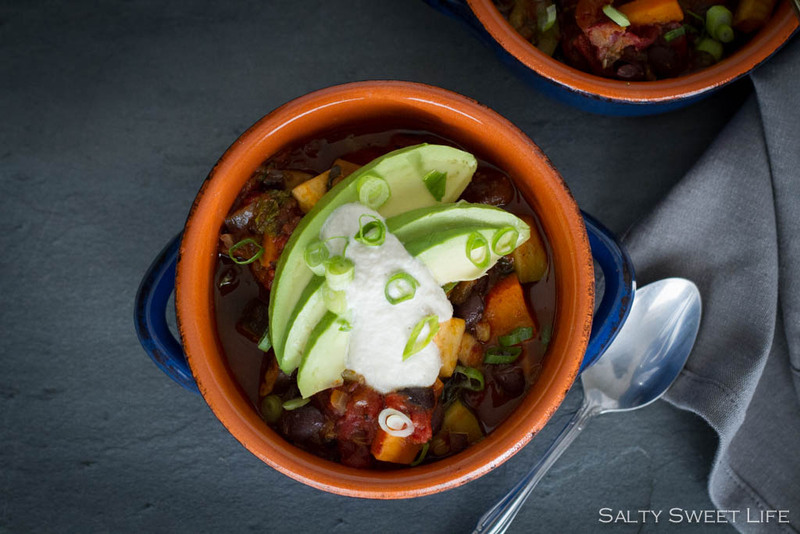 The chili is fantastic the first day that it’s made, but if you can, make it a day ahead. You’ll find that the flavors really come together after a night in the refrigerator! Heat 2 tablespoons of coconut oil in a large soup pot. Saute the onion and garlic until they become translucent and begin to brown. Add 1/2 cup of the vegetable stock to deglaze the pan. Add the chili powders, cumin, smoked paprika, chopped chipotles to the pot and stir well to completely coat the onion in the spices. Cook for about 1 minute until the spices become fragrant. Add the cubed sweet potato and the remaining 2 cups of vegetable stock to the pot and simmer for 6 to 8 minutes until the potatoes start to become tender. Pour the canned tomatoes into a large bowl and crush them with your hands, discarding any tough bits. Pour the crushed tomatoes into the pot with the potatoes along with the zucchini, mushrooms and the rinsed canned beans. Season with a teaspoon of kosher salt. Simmer for about 20 minutes until all of the vegetables are tender. Add the chopped kale and cilantro to the pot and cook for an additional 5 minutes until the kale is wilted. 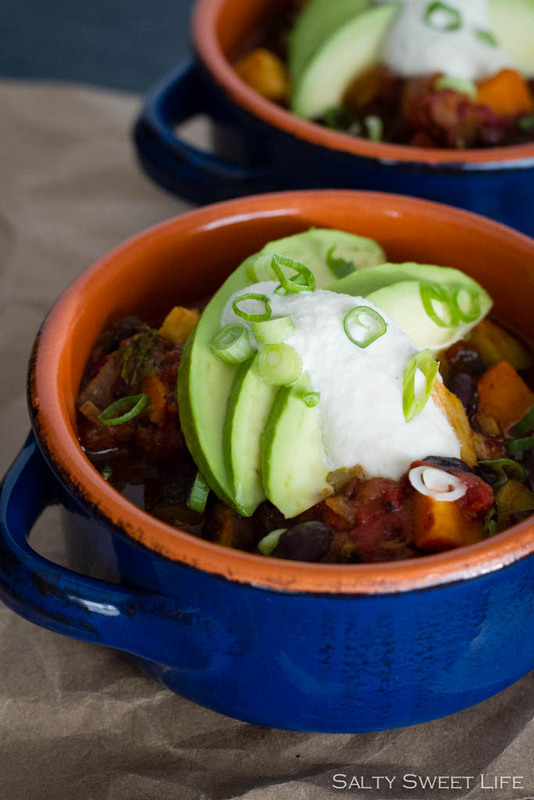 Serve with chopped avocado, sliced green onion and dairy-free sour cream (recipe follows). In a medium bowl, soak the cashews in water for at least 2 hours. Thanks Julie!! Greg’s chicken salad is pretty epic and everybody loves it! Thank you for the compliment Doug! I’m really glad you enjoyed it! I have yet to try to make cashew cream. It sounds like it would be a great addition to this chili. And I love the smoky additions of the chipotle and paprika! Thank you Lori! The cashew cream is kind of magical in that it’s fun to see nuts and water turn into something thick and creamy! It really does temper the heat of the chili, just like regular sour cream would! I keep meaning to get some cashew butter/cream I’ve heard great things and haven’t yet tried it! This looks great! Thank you Christina! That cashew cream is super easy! I hope you get to try it out!